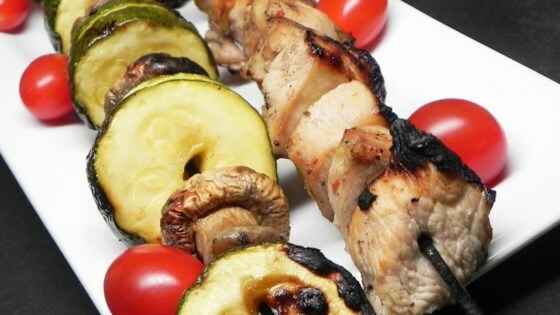 "Grilled turkey, mushrooms, and zucchini marinated in Italian dressing and cooked on the grill. A great recipe for the end of summer or early fall." Combine turkey, mushrooms, and zucchini in a 13x9-inch dish. Pour Italian dressing over mixture and stir to coat. Cover dish with plastic wrap; marinade in refrigerator 2 hours to overnight. Thread turkey, mushrooms, and zucchini slices onto skewers until all the ingredients have been used. Discard excess marinade. Cook the skewers on the preheated grill, turning frequently until nicely browned on all sides, and the meat is no longer pink in the center, about 15 minutes. Turkey burgers stuffed with flavor!